From the time he walked down the ramp to the cage and in the early goings of his main event match against Martin Nguyen in the promotion’s first-ever cross-divisional championship showdown, Folayang looked so collected and in control. Until midway through the second round. A perfectly-timed right hand attack by Nguyen – similar to how Juan Manuel Marquez stopped Manny Pacquiao in their last faceoff in in 2012 — sent Folayang crashing down to the mat. Hard. 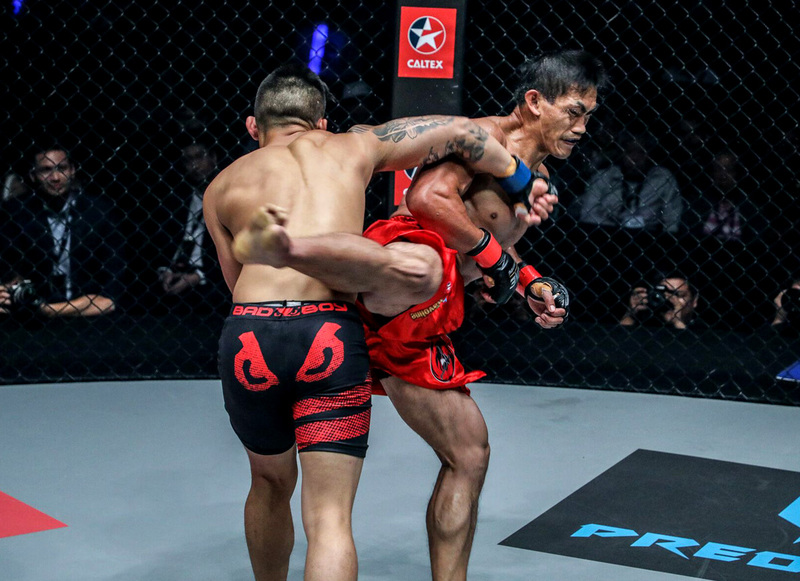 Eduard Folayang, in red shorts, absorbed a solid hit from Martin Nguyen that ended his reign as ONE Championship lightweight king. In an instant, the cheers that echoed throughout the Mall of Asia Arena turned into shocked gasps, the crowd of thousands in seeming disbelief that the hometown hero, the revered face of MMA in the Philippines have been knocked out cold. The night many expected to be a dream come true from Folayang, who went into the fight undefeated since January 2016, virtually turned into a nightmare hoped to be unreal. It goes without saying that his loss to Nguyen on the night of November 10, 364 days since Folayang scored a huge upset against Japanese legend Shinya Aoki to snag the ONE lightweight belt, will be the most bitter pill to swallow for the former secondary teacher from the Team Lakay stable. “The journey doesn’t end here.” Team Lakay’s Eduard Folayang vows to fight on and hopes to once again have the ONE Championship lighweight belt resting on his shoulder. Although shaken and with a tinge of disappointment, if there is one thing the 33-year-old – and his supporters, have learned throughout his storied career, borne of his Igorot roots, it’s that the warrior in him will stand up from the fall, dust himself off, and try again. The proud son of Baguio City, although shaken and with a tinge of disappointment, vows to keep going and fight on. “I thank God for His protection. At this point, I assure my followers and the fans of Team Lakay that I am alright and there is nothing to be anxious about. I am still in good physical condition,” he expressed. “I believe challenges inside and outside the cage always bring out the best in us. I assure you that the journey doesn’t end here. Team Lakay and I will exert our best efforts to wave our Philippine flag more triumphantly in 2018,” ended Folayang. What is a jade roller and does it really work?